After just the 800 free relays were swum Wednesday night, the first full session of the Texas Invite took place this morning. The meet will be a measuring stick for teams to gauge where they are at. All swimmers will have had varying degrees of rest heading into the meet, but we can certainly expect some fast times after we saw some fast splits come out of the 800 free relays last night. Danielle Valley of Wisconsin paced the women’s 500 free prelims, coming in at 4:42.97 for the top seed. Bonnie Brandon of Arizona was 2nd (4:43.46), Joanna Evans of Texas was 3rd (4:44.15), and top seed Chelsea Chenault of USC cruised in for the 4th in 4:44.20. Also qualifying for the A final was Daniela Georges and Emma McCarthy (Arizona), Quinn Carrozza (Texas), and Jenny Holtzen (Wisconsin) who was 8th in 4:46.89. 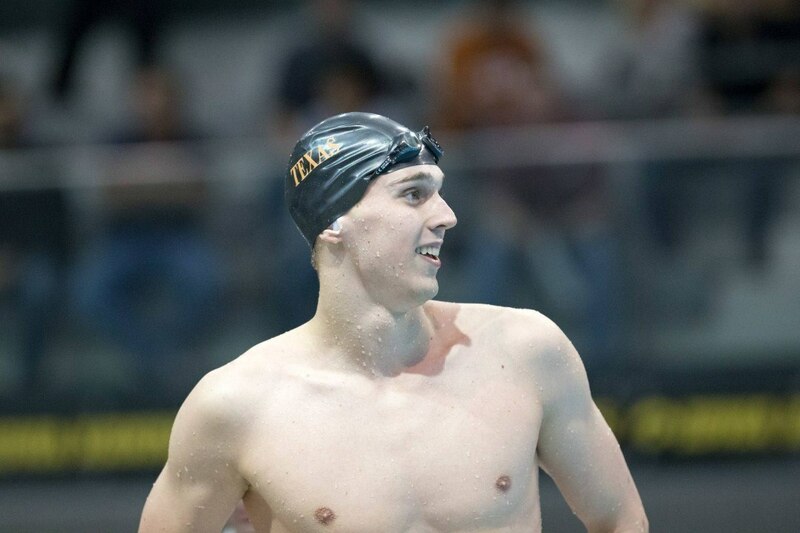 Defending NCAA champion in this event Clark Smith cruised to the top seed in the men’s 500 free in a time of 4:13.89, the top time in the NCAA this year. Smith is reportedly shaved and tapered for the meet, so we should expect to see something fast tonight. Improving his best time from NCAAs last season (4:09.72) isn’t out of the question, nor is the American record of 4:08.54 from Peter Vanderkaay in 2008. The 2nd seed went to Matthew Hutchins of Wisconsin in 4:17.59, 3rd to Chris Wieser of Arizona in 4:17.73, and 4th went to Texas freshman Townley Haas in 4:19.10. Also qualifying for the A final was Nick Hogsed and Ty Fowler (Arizona), Sam Lewis (Texas) and Reed Malone (USC). Along with Smith, both Haas and Malone should be dangerous tonight after strong performances in the 800 free relay last night. Scratches in this event included Jack Conger and Clay Youngquist. After starting off the meet with a fast lead-off leg in the 800 free relay, Madisyn Cox of Texas continued to swim well here posting the top time in the women’s 200 IM prelims in 1:55.39. That time is good for 3rd fastest in the country this season. 2nd went to Kirsten Vose of USC in 1:56.39, and 3rd and 4th went to Annie Ochitwa (1:56.97) and Mackenzie Rumrill (1:58.21) of Arizona. Also qualifying for the A final was Sonia Wang (Harvard), Riley Scott (USC), Nora McCullagh (Texas) and Anna Meinholz (Wisconsin) who was 8th in 2:00.06. In the men’s race top seeded Jake Taylor of BYU grabbed the top time in 1:44.27, ahead of Will Licon (1:44.85) and Ryan Harty (1:44.97) of Texas. Taylor’s time puts him in 2nd in the country, Licon now sits 3rd and Harty is now 5th. Taylor also set a new BYU record, erasing his own record of 1:44.96 from 2014. Nolan Tesone of Louisville currently sits 1st at 1:44.07. Also making the final was Morten Klarksov (USC), Thane Maudslien and Rasmus Skjaerpe (Arizona), and John Martens and John Shebat of Texas. Shebat was 8th in 1:46.53. 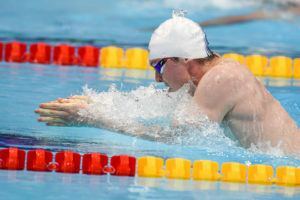 Breaststroker Andrew Wilson qualified for the B final in 1:47.35, after his breaststroke split (28.53) was faster than his backstroke (28.75). Joseph Schooling of Texas scratched this event. Shortly after qualifying for the 200 IM final, Annie Ochitwa of Arizona posted the top time in the women’s 50 free in 22.22. 2nd place went to Rebecca Millard of Texas in 22.26, 3rd went to Katrina Konopka of Arizona in 22.29 and finishing 4th was Chase Kinney of Wisconsin in 22.30. Rounding out the field for tonight will be Anika Apostolan and Evan Swenson (USC), Taylor Schick (Arizona) and Jessica Unicomb of Wisconsin who was 8th in 22.68. The Texas men dominated the men’s 50 free, putting 4 men into the A final including the top three seeds. John Murray (19.26), Brett Ringgold (19.54) and Matt Ellis (19.62) posted the top three times of the morning. Murray’s 19.26 puts him 3rd in the country behind only Caeleb Dressel (18.77) and Michael Chadwick (19.17). Arizona got three men into the final, with Renny Richmond (4th), JP Beach (T-5th) and Chad Idensohn (8th) cracking the top-8. Tate Jackson was the 4th Texas man who qualified, and Cannon Clifton rounds out the A finalists. Jackson and Clifton tied with Beach for 5th in 19.97, and Idensohn was 8th in 19.99, as sub-20 was required to make the final. Notable in the B final is Townley Haas who was 12th in 20.29, and Reed Malone qualified 30th (21.05) in the D final. Jack Conger scratched this event, along with the 500 free. We will likely see him on both the 200 free and 400 medley relays tonight. Conger didn’t swim any individual events on the first day of NCAAs last year, but was clutch for the Longhorns on both of these relays as they won both. The 200 free relay will start off tonight’s session, and the 400 medley will finish it. Finals go off at 6 PM CT, 7 PM EST. My guess is that based on the times, a lot of people are shaved and tapered at this meet. I am so tired of this type of comment. Who cares? And I guess I’m tired of people like you that make snide comments. It was in reply to a line in the story regarding the 500 of Smith and about him being shaved and tapered. If you look at the times, many of them dropped dramatically. Just an observation, nothing more, nothing less. This is an extremely relevant comment. When teams are prepared differently it’s very difficult to compare times obviously. The only team here that is fully shaved and tapered is Arizona. Take that for what it’s worth. 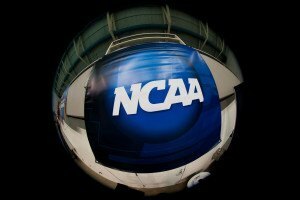 Both UT teams will be MUCH faster at NCAAs. Hook ‘Em Horns! If you have the ability to let them know at Texas, the live scoring is not being kept current and lots of people are awaiting the results. Thanks! I am here. Passing the word on this. According to meet operations they are uploading results as soon as each event is finished. Might be a browser based issue. Give that a try. Hi Rick – the solution to this is usually on the user’s end. You either 1) Hard refresh the page every event (Ctrl + Shift + R on a PC), or two, right click, open the result in a new tab, and perform the same reset until they show up. Unfortunately, has to do with the way browsers work, and nothing meet management can do about it. 500 free will be a great race. Expect to see Townley Haas go low too.